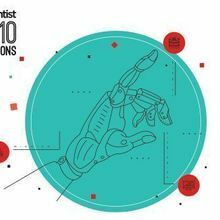 The Scientist’s annual Top 10 Innovations competition has again turned up some exciting new products that are poised to revolutionize the work of life scientists. Familiar names, such as Illumina and Leica, win again with updates to their sequencing and imaging technologies, while newcomers like Sciencescape, Organovo, and Edico Genome debut with novel products that caught the eyes of our independent, expert judges. 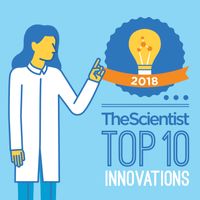 The Top 5 of this year’s winning innovations involve the process of genome sequencing: tools to do the actual sequencing, technologies to make it easier to prepare genetic regions for sequencing, and a processor that can handle the avalanche of data that results from such analyses. The Dragen Bio-IT Processor can cut genome analysis to a fraction of the time it takes using older technologies—a feat that earns it top billing in this year’s contest. San Diego–based Illumina garners the second and third spots with its latest sequencers, one of which (the third-place HiSeq X 10) achieves the long-awaited $1,000 human genome milestone. 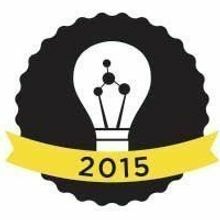 Other cool tech rounds out the 2014 Top 10 innovations, from a human liver model that remains phenotypically stable for 40 days, to a literature-management tool that makes keeping track of the flood of papers coming out in any field as easy as following a Twitter feed. 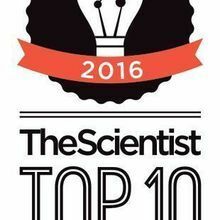 It was a tough job for our panel of expert judges to pick the 10 best life-science products in a year when so many innovations came down the pike, but as ever, the cream has risen to the top. 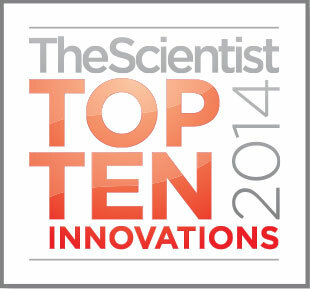 Read all about the winners of the Top 10 Innovations for 2014, and be sure to visit www.the-scientist.com for lots of extra Top 10 information, including expanded comments from our judges and a look at products that earned honorable mentions in this year’s contest. Manager of the Genomics Core Facility at New York University’s Center for Genomics and Systems Biology, where she oversees operations and assists researchers with experimental design to maximize their use of the facility, which offers services ranging from next-generation sequencing (NGS) to flow cytometry and more. Rock began her career as a research scientist at NYU. Managing partner at Domain Associates, a health care–focused venture fund creating and investing in biopharm, device, and diagnostic companies. She began her career as a scientist and pursued drug-discovery research at Novartis/Syngenta for nine years. Cofounder of Isis Pharmaceuticals and founder of Ibis Biosciences, now part of Abbott, where he is divisional vice president and Carlsbad site general manager. He was a primary inventor of the Abbott’s IRIDICA technology developed for infectious disease diagnostics. 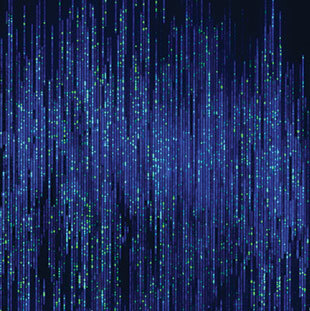 As genomic sequencing gets cheaper and more commonplace, the challenge becomes analyzing the avalanche of data that results. Typically, that responsibility falls to clusters of servers, which are bulky and energy-intensive to maintain. The DRAGEN Bio-IT Processor developed by Edico Genome in La Jolla, California, shrinks the physical bulk of genomic analysis to a chip that could be installed in a server the size of a desktop computer. The product also shrinks the cost of data analysis; Edico says users can save $6 million over four years by analyzing 18,000 whole genomes using DRAGEN. “We do all that processing in a much faster time,” says Edico’s president and CEO, Pieter van Rooyen. A genome that ordinarily takes 24 hours to analyze takes just 18 minutes with DRAGEN, according to Edico. Sequenom, a biotech company that performs 150,000 prenatal genetic tests annually, has been an early tester of DRAGEN. Tim Burcham, the vice president for bioinformatics software at Sequenom, confirms that DRAGEN lowered the analysis turnaround, which typically takes 4–5 days, by several hours. “Alignments are 30 times faster on Edico hardware than normal software,” says Burcham. ROCK: This looks to be a promising solution for processing data efficiently and quickly. SCHADT: The DRAGEN Bio-IT Processor is among the first accelerated hardware platforms to make possible the processing of whole-genome sequence data in 20 minutes on a single processor. Illumina’s pioneering developments in benchtop sequencing just keep on coming. After earning a place among The Scientist’s Top 10 Innovations of 2012 for the MiSeq sequencer, the genomics firm unveiled the MiSeqDx in November 2013. 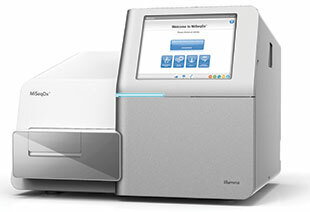 The MiSeqDx, a $120,000, breadbox-size gadget, brings next-generation sequencing to clinical labs. The instrument is the first next-generation sequencing tool approved by the US Food and Drug Administration (FDA) for clinical diagnostics. The sequencing kits available include two cystic fibrosis assays and one choose-your-own-target kit. Users design their own oligonucleotide probes, then proceed with the reagents and workflow provided by Illumina. “It’s really a way to get an FDA-cleared platform and clinical-grade reagents for a proven technology, but give clinical labs [versatility] in designing their particular protocol,” says Illumina’s senior vice president and general manager of life sciences, Kirk Malloy. KAMDAR: The first genome took a full decade and cost $100 million to complete. Amazingly, MiSeqDx can now do this in one day and for ~$5,000. The FDA clearance of MiSeqDX will accelerate the use of genetic information for precision medicine. ROCK: The MiSeq is simple and easy to use and now with FDA clearance this can mean great advancements in diagnostics and health care. Illumina’s newest sequencer reaches a long-anticipated milestone: the $1,000 human genome. The HiSeq X Ten is sold as a group of 10 machines, each with the ability to sequence 32 human genomes per week at 30x coverage. This allows a research consortium to sequence tens of thousands of genomes in a year, enabling whole-genome analyses at population-level scales for the first time. The speed and quality of the sequences produced by HiSeq X instruments rely on precisely patterned flow cells and improved amplification chemistry. “With the patterned cells, you can not only get a lot higher density of the clusters, but you can image very quickly because every flow cell is exactly the same,” says Kirk Malloy, senior vice president and general manager of life sciences at Illumina. At a cost of $10 million, the HiSeq X Ten is suited to large research centers and consortia. The New York Genome Center (NYGC), a nonprofit association of more than a dozen research institutions, is among 15 early adopters of the technology. ECKER: Illumina’s footprint on genomics is unsurpassed. SCHADT: The HiSeq X 10 is the first next-generation sequencer to deliver the $1,000 genome, one of the more dramatic achievements in the life and biomedical sciences. Dicing genomic DNA into bits is essential to obtain short-read, high-coverage sequence data, but this process destroys the genome’s broader topography. The IrysChip from BioNano Genomics provides a high-throughput platform for visualizing large-scale genomic structure, with applications for mapping, assembly, and evolutionary analyses. A series of enzymatic reactions incorporate fluorescently labeled nucleotides at specific sites throughout the genome—typically seven-base-pair restriction sites. Researchers then add the labeled DNA to a silicon chip with two flow cells, each consisting of about 13,000 50-nanometers-wide channels, says BioNano Genomics CEO Erik Holmlin. The ultranarrow channels cause the DNA to stretch out, and the chip acts as a sophisticated electrophoresis chamber. The system captures high-resolution, single-molecule images of even a very large genome’s structure. One IrysChip V2, released in October 2013, can analyze the structure of a human genome, for about $900, while the task would require at least 10 separate V1 IrysChips, the first iteration of BioNano’s technology. Joshua Udall, a plant geneticist at Brigham Young University, is using the IrysChip V2 to examine structural variations among cotton species genomes. “Cotton has a unique genome that is very well suited to this type of analysis,” he says. Data from the IrysChip will help Udall’s team improve the genomic maps of cotton and reconstruct the genome’s structural evolution. BAYES: This tool permits a whole-genome map preserving all regions and structural variations, fundamental to understand human diversity and disease. KAMDAR: The IrysChip V2 paves the way for researchers to study the biological significance of structural variations. 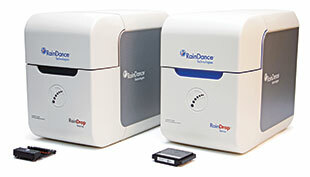 RainDance Technologies’ droplet digital PCR platform offers sensitivity and specificity. “We’ve been using the RainDrop System in our study of circulating tumor DNA,” says John Martignetti of Mount Sinai Health System in New York City who, along with his colleagues, is studying how recurring gynecologic cancers linger in some women. The arrival of digital machines on the market, from RainDance and other firms, has ushered in a new era of PCR, making tracking circulating tumor DNA feasible. By harnessing the power of droplets to divide and direct a sample into separate reactions, researchers using the RainDrop Digital PCR System can pick up—and quantify—rare sequences, providing an estimate of relative gene expression in single cells. “By partitioning the sample into many different droplets, you’re able to get a digital signal and get a real, true number on what’s out there in the sample,” says Frederick Eibel, senior vice president of strategic marketing at RainDance. Despite its hefty price tag (around $125,000), Eibel says the system’s droplet generator can also be used for sample enrichment prior to sequencing. KAMDAR: This is a highly sensitive tool for precise quantification of nucleic acids using standard, probe-based qPCR reagents. ROCK: Experiments are becoming more and more fine-tuned with less and less input, and for that an instrument like this is a must. After winning a spot in last year’s Top 10 Innovations contest for its SR GSD 3D superresolution microscope, Leica’s upgrade of its other superresolution platform, the TCS SP8 STED, continues the winning trend. Released in December 2013, the TCS SP8 STED 3X allows researchers to peer deeper than ever into cells to image molecular function in three dimensions and at several frames per second. Christian Eggeling, a molecular immunologist at the University of Oxford, uses the STED 3X to explore changes in the organization of immune receptors on the surface of mammalian cells, and his team generates 3-D images of structures and molecules within cells. “It looks like this nuclear research and cytoskeleton research will give us new insights based on this 3X upgrade,” he says. The STED (STimulated Emission Depletion) principle, devised by 2014 Nobel Laureate Stefan Hell of the Max Planck Institute for Biophysical Chemistry in Göttingen, Germany, provides optical access to subcellular structures and dynamics on the nanoscale. In addition to providing superresolution in the X-Y plane—about 30 nm, according to Jochen Sieber, product manager of superresolution technologies at Leica—the instrument achieves a resolution in the sub-100 nm range in the Z dimension, making the STED 3X capable of generating highly detailed 3-D images. “Biology happens in all three dimensions, so you want to observe it in the very same way,” says Jochen. Adding the STED 3X functionality to an existing confocal instrument can start from $200,000. SCHADT: The STED 3X enables the direct observation of the finer details of cells that have been previously unseeable. BAYES: This superresolution technology allows 3-D visualization in nanoscopic detail of subcellular structures, cell compartments, interactions of proteins, and interrelations of various structures—even in living specimens. 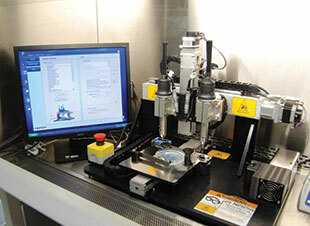 The 3-D liver tissue, which Organovo launched this April, is churned out by the company’s proprietary bioprinting. Renard adds that the model can be printed directly into a variety of culture containers, including 24-well plates; costs “in the low one hundreds up to $200,000 for a typical comprehensive and thorough study”; and produces natural liver proteins, such as albumin and transferrin, while synthesizing cholesterol and retaining cytochrome P450 activities. 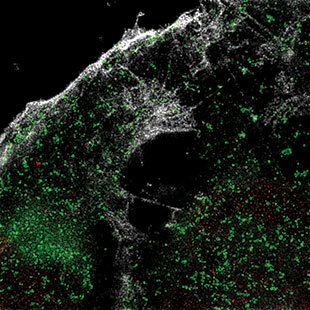 This makes for an experimental arena that very closely models in vivo human liver function. ROCK: This lets researchers get one step closer to in vivo models and have more confidence in their findings. KAMDAR: If Organovo’s living 3-D human tissue liver model can provide a more predictive assessment of liver-specific toxicology and metabolic function than traditional animal systems, this will be a huge breakthrough in the drug-development world. 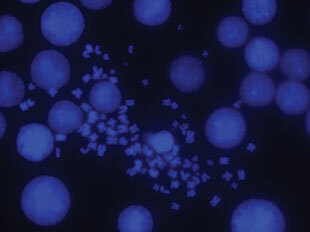 HAP1 cells contain no Y chromosome and two copies of a piece of chromosome 15 and have a fibroblast-like morphology. Haplogen now has more than 800 CRISPR-modified knockout HAP1 lines available that can be shipped within a week for $990 per cell line, and that library continues to grow by about 100 genes per month, says Bürckstümmer. Or, for the same price, customers can get a custom-made line with any gene they want knocked out. It usually takes 8 to 10 weeks to deliver on custom orders. Haplogen customer Steve Jackson, a molecular biologist at the University of Cambridge in the U.K. and a member of The Scientist’s advisory board, is launching a set of experiments based on Haplogen’s CRISPR-modified cells lacking one of the 90 or so genes for deubiquitinating enzymes (DUBs) that are expected to play a role in DNA repair. “It’s still early days, but I’m just very excited by the kinds of science that I hope my lab will be able to do with these HAP1 knockout cells,” Jackson says. BAYES: This technology allows a scalable, precise, and efficient generation of knockout cell lines faster and cheaper than previously existing methods. KAMDAR: A systematic approach to knock out all human genes will ultimately allow for annotation of all human gene functions. Blood donor/patient matching is critical for transfusions; beyond blood type, blood banks and hospitals screen for rare antigens on the surface of red blood cells to assess compatibility. Immucor’s array-based PreciseType HEA test provides more-detailed results in less time than traditional serological screening. This molecular diagnostic test screens for genes that govern the expression of 35 antigens, enabling the identification of rare markers, which helps clinicians reduce the risk of alloimmunization or other potentially harmful transfusion-related reactions. “In patients who get multiple transfusions, it’s generally very beneficial to do a more extensive look at more blood-group antigens,” explains Immucor chief scientific officer Joanne Spadoro. In May, PreciseType became the first in vitro diagnostic (IVD) to gain FDA approval. Immucor declined to disclose pricing, but noted that IVD testing is reimbursable by insurance companies. Ricardo Sumugod of Northwestern Memorial Hospital in Chicago and his colleagues have been using PreciseType since it was first marketed for research use only. At a recent meeting, Sumugod’s team presented unpublished data on a new blood type it discovered using the assay paired with targeted sequencing. This molecular typing is “more accurate than the existing serological assay,” says Sumugod. BAYES: This test brings accuracy and precision to molecular donor/patient matching that was not formerly possible with serology testing. ECKER: Matching blood types for donors and recipients better is an advance in health care. The PreciseType HEA test does exactly that. As Sam Molyneux was working toward his PhD in cancer genomics at the University of Toronto, he ran into a problem that all scientists are familiar with: literature overload. “[Due to the volume of papers] in the sciences, essentially no one has any idea what’s being published on a daily, weekly, or even monthly basis,” says Molyneux. 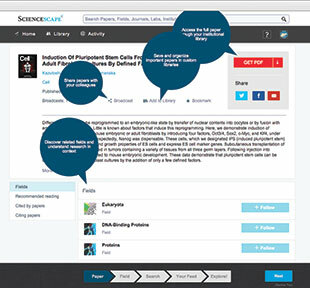 So he teamed up with his web-developing sister Amy to found Sciencescape, which offers a “Twitter-like experience,” according to Molyneux, allowing users to browse their personalized news feed of newly published papers that fall into any of the categories they choose to follow. To date, there are more than 50 million such categories, including specific topics, researchers, genes, diseases, proteins, journals, and more, collated by sophisticated text-mining techniques. Eventually, Molyneux hopes to even include categories corresponding to geographical places, buildings, institutes, and specific materials and methods. “It basically replaced all of my previous literature-associated methods, which [were] sort of cobbled together between PubMed alerts and RSS feeds and things like that,” says Jonathan Coloff, a postdoc in Joan Brugge’s lab at Harvard Medical School. The site, which is free to academics and currently boasts around 170,000 users, launched in beta form in November 2013, and in October of this year rolled out its latest version. ECKER: Anything that works well in this area will help everybody. ROCK: This lets you discover papers in your relevant fields with very little searching since they are brought right to your computer screen. Clarification (December 2): Ed LeCluyse is presently a paid consultant to Organovo as it develops its next generation of liver models for specific applications and diseases of the liver. The article has been amended to note this change.